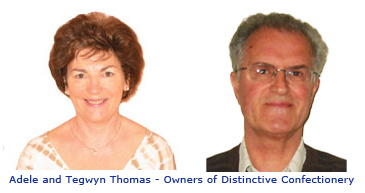 Distinctive Confectionery was established over 20 years ago and is owned and managed by Tegwyn and Adele Thomas, a husband and wife team, together with their dedicated staff. Tegwyn’s background is in Sales and Marketing and Adele’s in teaching. Now with over 20 years experience together in this industry, they bring a wealth of knowledge and expertise. Distinctive Confectionery offers a wide range of both chocolates and confectionery. We use all the best European chocolatiers according to their specialism, Lindt, Leonidas, Guylian and Duc D’o and Lessiters to name just a few. The quality of our chocolate is of paramount importance, that’s why only the finest ingredients are used in all of the chocolates we supply. If you prefer to have Fairtrade Organic chocolate this is also available. We pride ourselves on the high level of service we provide. Our experienced Sales Team are always on hand to discuss with you ideas for all your promotional confectionery needs. We use an expert Belgian chocolatier who can mould anything you can think of in chocolate, from chocolate stars to chocolate Oscars. Do ask for a sample of any product you are interested in. Presentation and taste are vital. We want you to taste and see the product before you order. We only sell quality products that you will be proud to have your name on. We use dedicated packers for all our chocolates and confectionery. Also we offer free insertion on packing of any promotional material you would like to include. In addition we have specially produced individual mailing boxes for each product. If you are unable to find exactly what you are looking for in our catalogue or on our website this doesn’t mean that we can’t supply it. Call us to discuss your ideas and we will advise as to the feasibility. We are experts in creating and sourcing new branded products. Nearly 20 years ago we produced one of the first personalised advent calendar with personalised chocolate in the Market. We pride ourselves on the fact that this first calendar is still one of the very best available and clients repeat their order for this product year after year.